Traveling across the Lost Desert is no mean feat, but with the added dangers of thieves, Scamanders, and Qasalan mummies, you would be lucky to make it past Coltzan's Shrine! In this game, you travel from from Qasala to Sakhmet, avoiding dangers and trying to beat your opponents there! Using your mouse, click the die to roll it and click one of your two characters to travel across the Lost Desert - Snakes and Ladders style! You start off at Qasala and follow the pathway to Sakhmet, trying to avoid landing on yellow tiles which, more often than not, trigger something bad to happen. Collect Neopoints and food while you go to keep the dangers at bay. Below is a picture of the game board. The board doesn't change from game to game, so you can get to know it. Green lettering signifies good things, while red lettering signifies bad. To move your characters, click the die on the event scroll when it flashes for you to do so and then choose which of your two players you wish to move. Whatever number you roll, the character moves that amount of spaces and collects that many Neopoints. When all characters reach Sakhmet at the end of the game, you receive the amount of Neopoints both your characters collected together. 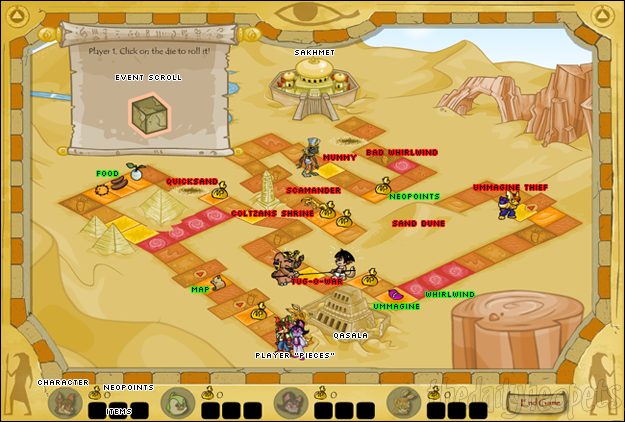 As your characters move across the Lost Desert, they will pass bags of Neopoints. These vary in value as you go up the path to Sakhmet and generally give higher amounts as you reach the end. Get as many as you can by landing on them - they will increase your score! Seven spaces in is the map item. If you land on this square with an exact roll, you will pick up the map, which allows you to to not get lost in Sutek's Tomb. If you land on one of the two Sutek's Tomb squares near the pyramids without carrying this map, you will be sent back to the beginning and you will lose 10 Neopoints from that character. The map can only be used once. Twelve spaces in is a whirlwind. 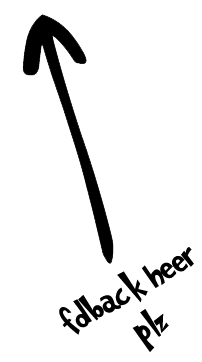 If you land on any whirlwind square (apart from the one near the end of the journey), you will be lifted to the end of the set of whirlwind squares in the same turn. However, be aware of the lone whirlwind square the end of the path to Sakhmet. If you land on this square with an exact roll, it will send you back to several squares before the "Tug-o-War" square and take away 60 points. The Lost Desert food items that appear on the board can save you from losing a turn if you land on the Scamander, mummy, or thief. Land on one of the squares with a food item on it with an exact roll to pick up the food item and protect yourself from the Scamander, mummy, and thief. Beware of the thief, though - he is only interested in the Ummagine. Each food item can only be used once. The quicksand appears a few squares before Coltzan's Shrine. If you land on it with an exact roll, you lose a turn. 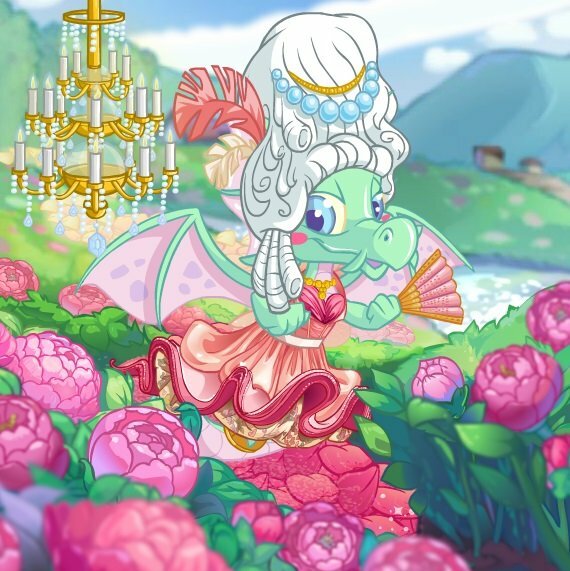 You can also lose a possible 12 Neopoints. If you land on the Coltzan's Shrine square with an exact roll, you will receive an event much like the regular Coltzan's Shrine - but in this case it's generally bad. Things like losing Neopoints or a turn are the typical messages. Occasionally nothing happens... if you're lucky! If you land on the Tug-o-War square with an exact roll, you will bet on one of the two characters to win. Which character you choose has no effect. After you have chosen, you roll the die. If you get a high number (4, 5 or 6), you win and gain 100 Neopoints. But, if you get a low number (1, 2 or 3), you lose a turn. The sand dune on your way to Sakhmet can be dangerous. Much like the popular saying "Three steps forward, two steps back", when you land on these squares you will always be ushered two squares backward. That means you'll need to roll a three or higher to make progress. The dune is six squares in length, so if you are at the square before the dune and roll a 6, it will pose no problems. If you land on the Scamander with an exact roll, you play a simple version of the game Scamander Swarm . Click on one of four doors shown on the event scroll. If it's the correct door, you'll get away scot-free, but get it wrong and you'll lose a piece of food or a turn. The Qasalan mummy will demand food from any character landing on his square with an exact roll. If you don't have food, the mummy will send you back two squares. To finish the game, all characters must make it to Sakhmet. To make it there, though, you must land on the final square of the path with an exact roll. A good strategy to get one of your characters to Sakhmet first is to storm one character ahead and, if a certain roll would get it into trouble (such as into quicksand), move the other player as a backup. Once your first chracter gets close to Sakhmet, and you can move the other character when you don't get an exact roll to enter Sakhmet. This will make sure none of your rolls are wasted while you wait for the right number to appear. However, the score you get after getting both of your characters to the exit as fast as possible is nowhere near enough for a trophy. Oddly enough, if you want to win a trophy, the best strategy is to keep yourself from getting to the exit as long as you can. The best way to score points is to enter the bad whirlwind near Sakhmet. As already mentioned, it will take you back to a few squares before the "Tug-o-War" square (and decrease your score by 60 points). Next, land on the Tug-O-War square, pick a player (no matter which one), roll the dice and get 4, 5 or 6, and win 100 points. Then, just repeat! Continue using the whirlwind and slowly gaining 40 points each cycle - if you win the Tug-O-War, that is. Keep going until you have enough points for a trophy. Yes, this strategy is rather boring, but it's the best way to earn a trophy. In order to land on the correct squares, make sure you're choosing which character to move wisely. One option is to set up your characters so one of them is exactly 1 square away from Sakhmet. That way, if you roll a number that is too high and would take you past the square you want to land on, you can click on the character near Sakhmet, who won't move because you would need an exact roll. If you roll a 1, though, remember to move the character not near Sakhmet! The game stars four well known Lost Desert stars. Brucey B is the star of the Neopets site plot 'Brucey B and the Lucky Coin ', an opponent in Cheat! and the mascot of the Brucey B Slots . Tomos and Nabile were stars of another Neopets plot, simply dubbed 'Lost Desert Plot '. Osiri is the owner of Osiri's Pottery in Sakhmet. Whether you're a 'Dungeons and Dragons' or a 'Snakes and Ladders' fan, I'm sure you'll find The Great Desert Race in tune with those classic games. It's different from the usual style of Neopets games and throws a few old faces in the mix too. It's a nice little Sunday afternoon game, and a relatively easy trophy, as long as you're willing to put in the time! Credit to bezzies_for_life for the whirlwind tip! The Snowager is awake. He'll be sleeping in 4 hours, 3 minutes.